Large (12-13) - £36.99 Only 3 left! Every pirate has their own distinct flair, and every member of a pirate crew might look completely unique. But as they gain swashbuckling experience (we'd guess by buckling a ton of swashes), all sea dogs start figuring out a few tricks that help make the pirate life a little less tough. So, what does a seasoned pirate never leave port without if they want to make things easier on themselves? Besides a well-sharpened sword, a couple changes of underwear, and a barrel of grog for those long, boring nights at sea. Any other ideas, or do you need to walk the plank? 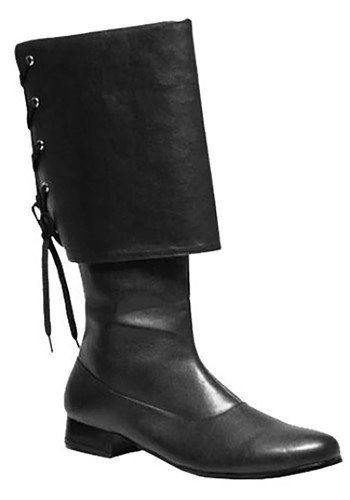 Well, if you're wearing these Buccaneer Black Boots, it sure would make walking the plank easier! Actually, walking anywhere would be easier in these sharp looking boots, especially when you're dressed up in your best plundering costume. The style of the folded down cuffs and boot laces will compliment any other dashing disguises, too, like a musketeer or Renaissance costume. This debonair footwear is a must-have for any pirate worth their salt!